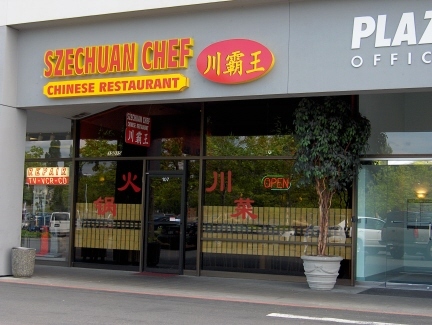 Update: In March 2010 Nancy Leson of the Seattle Times reported that the former chef at Szechuan Chef is now at Spicy Talk Bistro, 16650 Redmond Way, in Redmond. 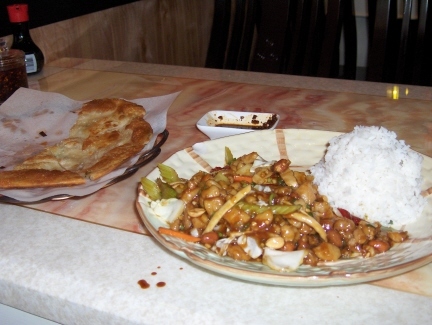 Szechuan Chef is still in operation, but the food described in this review is now being served at Spicy Talk. Szechuan Chef's business card says "Authentic Szechuan Food & Hot Pot." In my estimation it is one of the few Chinese restaurants that actually live up to their claim of authenticity. 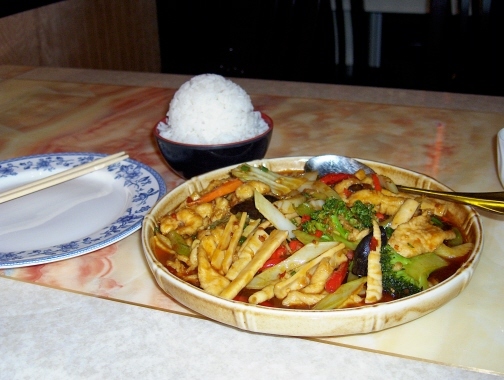 Sichuanese restaurants serve a number of spicy and oily dishes. Szechuan Chef follows this trend, and also serves a number of selections that are not spicy that I believe are just as representative of the province of Sichuan. Szechuan Chef has implemented a great feature by cooking each dish to the spiciness level the chef thinks is appropriate to bring out the proper flavor and presenting the authentic Sichuanese version. The patron can request that the spice level be changed, but having a default level is a much better method than the one used by most restaurants whereby you either have to specify a heat level and hope it will be done the way you want it, or that it is automatically cooked to the non-spicy "Americanized" level. My introduction to Szechuan Chef was with a dish called Chef's Special Tofu on the Hot Plate. I asked for medium spicy, which turned out to be similar to the average spice level for New Mexican food. The dish was cooked in a pan, then served on a hot plate. The server came to the table, placed a metal guard around the plate, cut up an onion that was placed on the hot plate, then poured the food on top. The reason for the guard became evident as the hot oil splattered all around the hot plate. This was the heavy, Sichuanese oil that is so good, but would also be very painful if it landed on bare skin while hot. On a later visit I was able to experience something that is available in few U.S. restaurants--an authentic Sichuanese Hot Pot. This is a large bowl of oil heated over a butane burner, with mounds of meat, seafood, and vegetables served on the side to be cooked in the oil as desired (the hot pot is served to a minimum of two persons). The one I sampled had a bowl split in half so that one side had a spicy red colored oil filled with chiles that was as hot as it looked, and the other side was non-spicy (good for cooking the lettuce, other vegetables, and tofu). A Sichuanese friend of mine said that the spicy side was authentic, but the mild side was not. Still, the entire dish was quite excellent (you would actually have to call it multiple dishes with chicken, pork, beef, fish, shrimp, along with some more "authentic" foods such as a boiled blood ball). If I had not had some expert help to show me how to cook the food and how to serve it, I may not have had the same opinion of it, but I believe this is something every Sichuanese food lover should try, and I cannot think of a better place for it than Szechuan Chef. A less exotic dish I tried was Deep Fried Tofu Szechuan Style made with probably the best black bean sauce I have tasted. The Chicken with Hot Garlic Sauce was a very colorful dish that tasted as good as it looked. The sauce was very well balanced with offsetting flavors that made it seem as if it was not primarily composed of garlic. The chicken and vegetables were excellent; in fact the variety of vegetables served made this an especially enjoyable dish to me. The Kung Pao Chicken was unlike any version I had eaten previously. The sauce was much more complex than the typical brown/black sauce served in American Chinese restaurants. It had a somewhat sour, vinegary taste, and lacked the ultra sweetness found in many versions. The vegetables included shredded celery and other goodies, and the variety of herbs and spices in the sauce must have exceeded the number of vegetables on the plate (I detected some ginger). The Green Onion Pancake is a quite popular appetizer, and was much better than the typical pancakes I have tried in various Japanese and Asian restaurants. It was a little greasy, but not to the extent that I typically experience. Like most things here, the Hot and Sour Soup was first class--one of the best I have ever tried. It is rare that I find a Chinese restaurant that I consider both authentic and delicious, but Szechuan Chef seems to excel at both every time I try it. I think if you have been disappointed at the "Szechuan" dishes served at most Americanized Chinese restaurants, you should not give up on the cuisine until you have tried this restaurant (or a very few other authentic Sichuan restaurants in the U.S.). It does not hurt that the decor is pleasant and comfortable, the service is good, and the prices are reasonable. I understand that the owners operated a restaurant in Sichuan province in China for twenty years before opening a restaurant in Seattle (originally they operated Seven Stars Pepper Restaurant in the International District). Their experience and expertise show in the food.